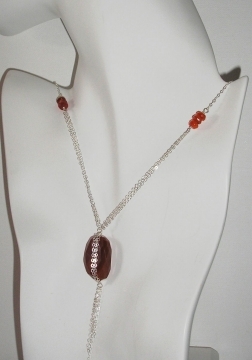 This is a great carnelian nugget pendant, made with a nice chunky faceted carnelian nugget bead, wrapped in fine sterling silver chain with a chain fringe on the bottom. Very contemporary, this sleek design will look great with everything. You can make this necklace style using any beads you like in any colors. 8 Small Carnelian Beads (style of choice) . I used 2 very small rondelle beads, and 6 larger faceted rondelle beads in my design. We will use some sterling silver wire and chain to create the pendant. I used 5 random lengths of chain for the "fringe" on the bottom of my bead, and wrapped my carnelian nugget bead in three chains. How many chains you use in your design is up to you. Cut a length of silver wire, several inches long. Using round nose pliers make a round loop on the bottom of the wire. This is where you will attach your chain fringe. If you need help learning to make a loop, follow these instructions. Cut your lengths of chain, and then slide your chain onto the loop (making fringe) then close the loop. 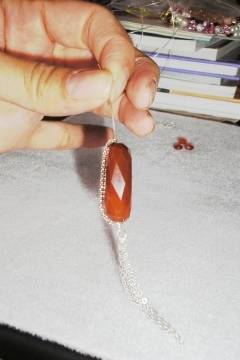 Next, we will wrap three pieces of chain around the carnelian nugget. This part is a little tricky because you want the chain to fit tightly on the bead but not so tight you can't easily attach the chain. 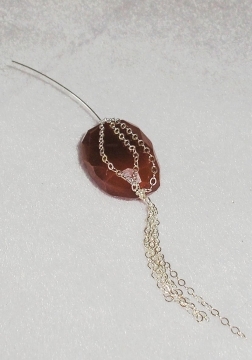 You will feed your wire through the ends of three pieces of chain, through the carnelian bead, then as you slide the wire out the top of the carnelian bead you will catch the three chain ends and feed the wire through the chain, thus attaching them to the bead (giving a wrapped appearance). TIP - Leave the chain longer than you need it on the top of the bead, and after you have attached the chain to the wire you can cut off the extra length using flush cutters. Now we will attach the pendant to the necklace chain. Decide how long you want your necklace to be, and how long you want each section of chain to be. Cut all the chain at once. For the next section the the necklace, I used three chains on each side, about 4 inches long. Cut your six lengths of chain to your desired length. Then, for the top part of the necklace, I used a single chain (about 4 inches long). Cut two more lengths of chain for the top part of the necklace. Let's attach the pendant to the necklace chain. Make a round loop on the top of your carnelian bead, and slide each of the six chains onto the loop, then close the loop. Spread the chain so you have three chains on either side of the necklace. 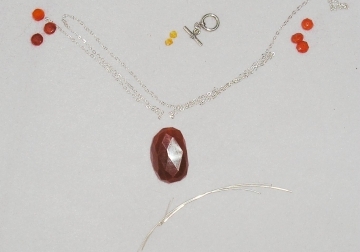 Now, we'll attach the three carnelian beads in the center of the chain. You will repeat this for both sides of the necklace: Cut a length of silver wire, and make a round loop. Slide the three chains on the loop, and close the loop. 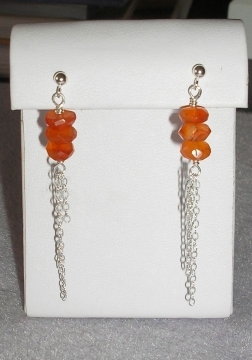 Slide three carnelian beads onto the wire, then make a wire loop. Slide the last chain onto the loop, then close the loop. You will now have a pendant with three chains attached to either side, attached to a three-bead component, and a single chain. We are ready to attach the toggle clasp. Cut two lengths of silver wire. Make a round loop, and attach it to the chain, and close the loop. Slide a bead onto the wire, then make a round loop and attach one half of the toggle clasp component, and close the loop. Repeat on the other side of the necklace to attach the other half of the toggle clasp. That's it, your new carnelian bead pendant is ready to wear! 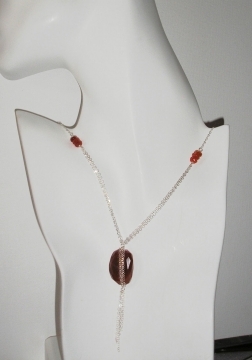 This necklace looks great with other carnelian jewelry.